THE JOYS (AND THE PERILS) OF THE OPEN TOP. So, you’re strolling along the promenade, soaking up the sun and taking in the sea air with half an hour or so to kill. At a bus stop alongside you an open top bus pulls up with decals promising “Breathtaking Sea Views”. There can be no finer way to admire the coastal scenery. 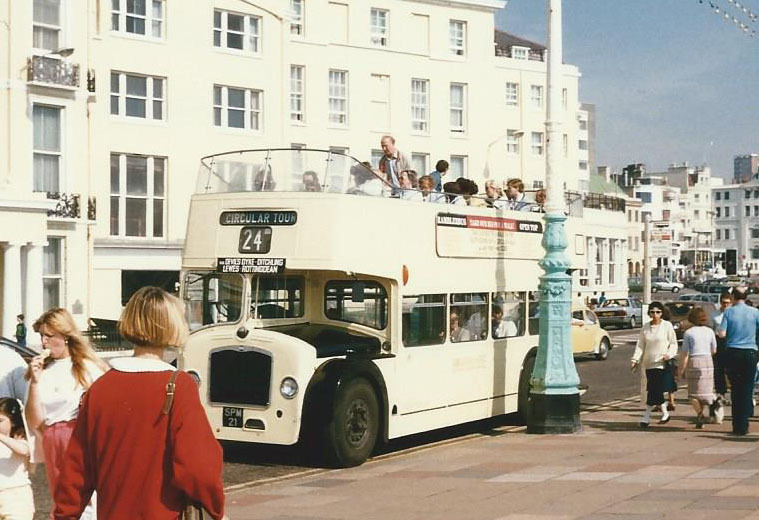 Brighton, Hove and District started it all back in 1936 with a small fleet of specially built double deckers painted in a cream livery, a trend soon copied by almost every operator within sight of the sea. The ride can be stunning. 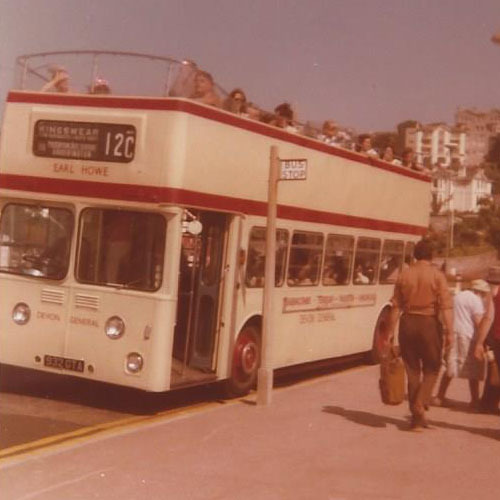 From the sixties through to the eighties Devon General’s Torquay to Brixham service with it’s ‘Sea Dog’ Leyland Atlanteans was always a joy, riding along the cliffs and hills beside the bay and deviating from the regular route to hug the coastline at every available opportunity. 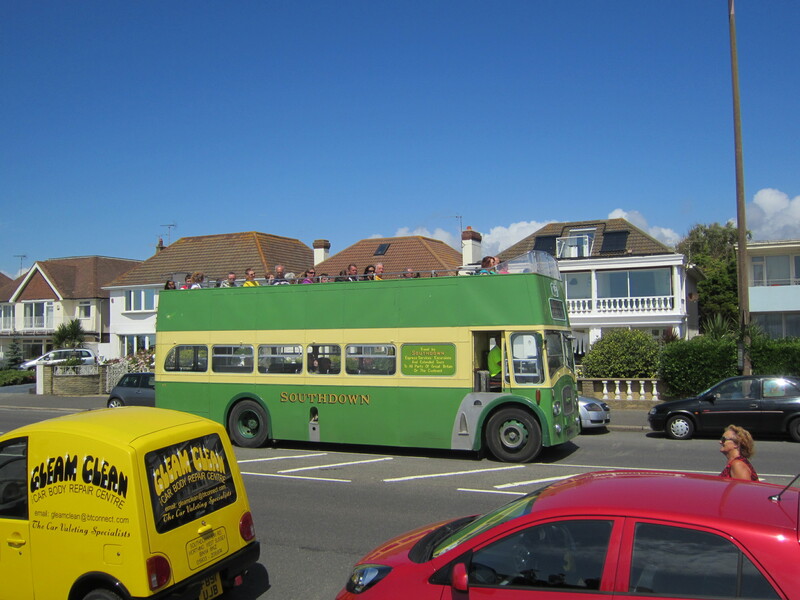 During the same period Southdown’s route 102 from Brighton to Arundel could boast at being the world’s longest open top service. Currently Wilts and Dorset’s service linking Bournemouth with Swanage is highly recommended with it’s unhindered views of Purbeck (looking up at the hills- no windows or bodywork remember!) and a ride on the Sandbanks Chain Ferry thrown in. On the Isle of Wight Southern Vectis’s ‘Island Breezer’ climbing out of Alum Bay to the Needles Battery is simply wonderful, though you do need a good head for heights. It must be remembered though that these services are at the mercy of the fickle seaside climate as I discovered on Brighton and Hove’s route 77 to Devil’s Dyke. “Breeze Up To The Downs” it said on the side of the bus. They weren’t kidding, “Breathtaking Sea Views” meant just that! I could have retreated to the lower deck but I was among a dozen (fool)hardy souls who were being terribly British about this, determined to have our open top bus ride by the sea and damn well enjoy it! There are of course the open top tourist buses giving guided tours and running commentaries in our major towns and cities. 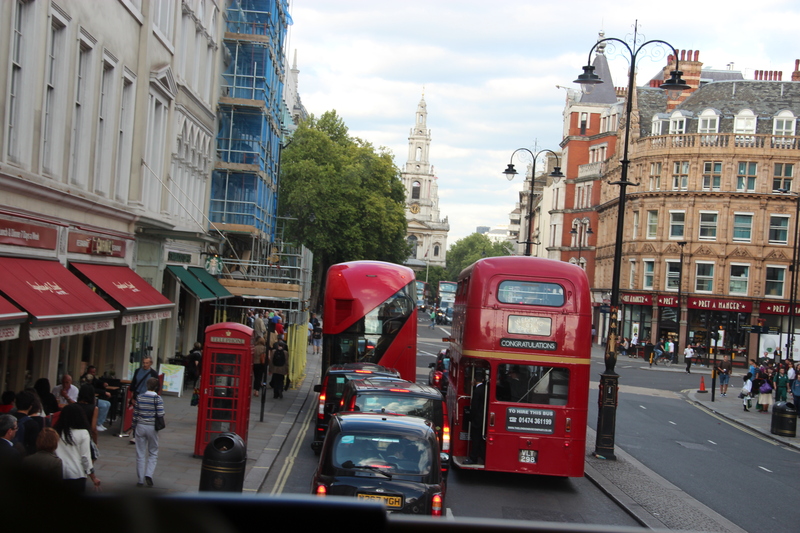 Being tour buses they are more expensive but they can offer a superb opportunity to see the sights from a very different angle, the unrestricted views looking up at the tall buildings while on the move on the London tours are impressive. For me the real joy of the open toppers is when they generally operate as normal buses, either substituting traditional vehicles or as summer services superimposed on the normal timetables. Panoramic views and a chance to travel with the locals, all for the price of a bus ticket. 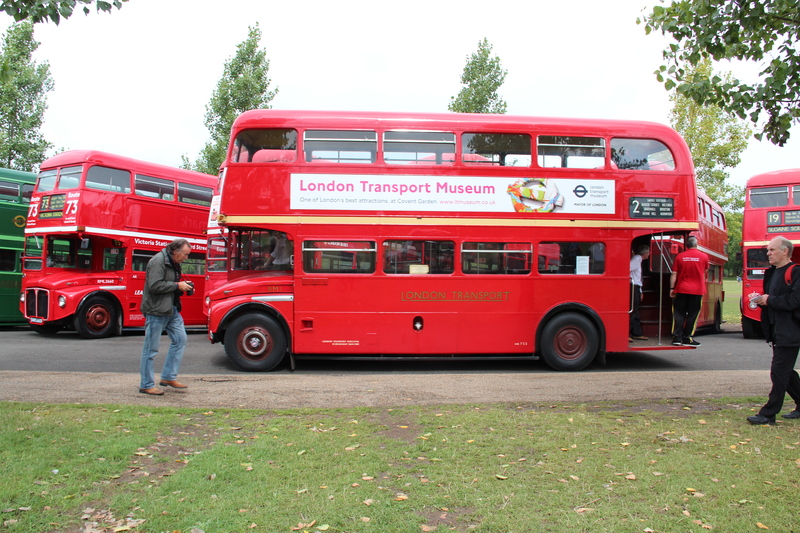 IT WAS SIXTY YEARS AGO TODAY……..
RM1, the first prototype Routemaster was unveiled to the press and bus industry at Earls Court. It wasn’t a stunning debut, it’s single-box destination screen and square ‘flat front’ look compared unfavourably to it’s predecessor the RT, as did the huge LT bulls-eye where the radiator should have been (it was located underneath). It wasn’t a unanimous success when it entered service two years later, drivers found it difficult adapting to it’s lightweight construction and semi-automatic gearbox. Along with three other prototypes it spent a short life in and out of service undergoing structural and mechanical alterations before being retired as a training vehicle at the end of the ‘fifties. After five years of research and development the first production models finally entered service in 1959, initially replacing the electric trolleybuses in the suburbs before being entrusted to the busy central London routes, by which time other major cities had introduced the more modern front entrance Leyland Atlanteans and Daimler Fleetlines, the Routemaster now looking somewhat out dated. 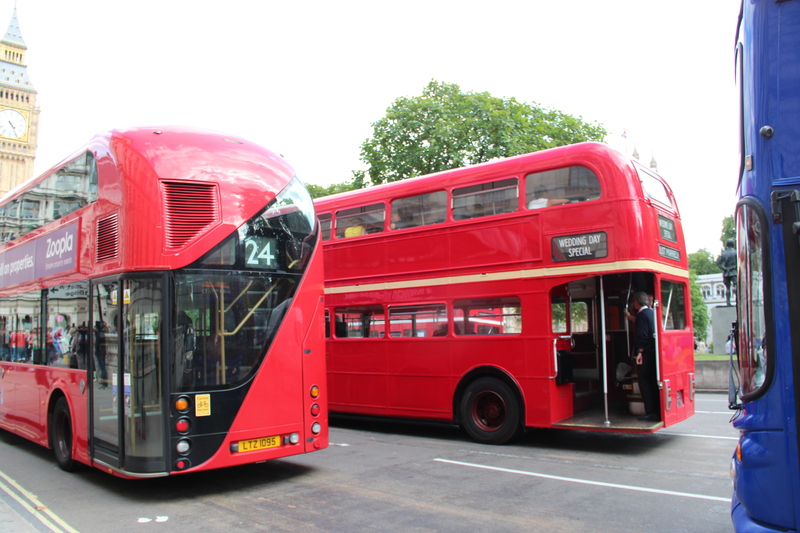 It wasn’t until around 1963, after much tweaking and fine tuning that the Routemaster settled into the shape and design that we came to know, and Londoners came to love. For a while it was just another bus, sharing the streets with the RT’s until their withdrawal in 1979, coinciding with near full scale driver only operation across the rest of the country. I believe it’s at this point, nearly five years beyond it’s original life expectancy that the RM became became an icon, making London the only place where you could still ride an open platform bus with a conductor. After several failed attempts to replace it with something more ordinary and functional, the last Routemaster in normal service rolled into Brixton garage at the end of 2005. Ten years later it’s successor, the New Routemaster is settling in on the capital’s streets, just as controversial and facing the same indifference from the press and industry as it’s predecessor, but many Londoners are taking to it and it’s enthusiastically received by visitors to the capital. A few original RM’s survive on a heritage route across London, sometimes sharing road space with their descendants allowing visions of past, present and maybe future icons of the London street scene.